Yesterday was hot. It was about a gazillion degrees outside, but at least I got to spend most of the day inside. Today it jumped past the gazillions, into the trazillions and then up into the bazillions. It didn't help that I had to spend the first five hours of my work day at a job site measuring the outside of a building. 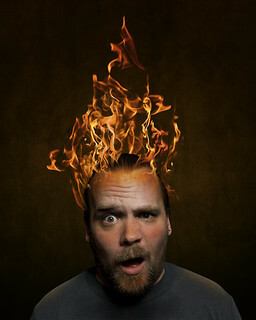 It really did feel like my head had caught fire.